Printed on 70lb Adhesive Paper Stock. Available in increments 1000, 2500, and 5000. Available with UV High Gloss only. Full Color Foil stickers are one of the most sought-after, versatile, and inexpensive ways to market your product, service or business. 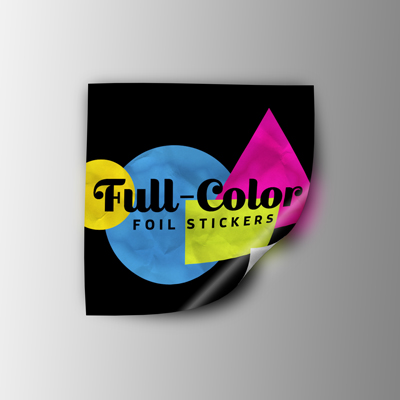 Customers young and old will be delighted to receive your business’s or initiative’s full color foil sticker for use on paper, crafts, car interiors, lockers, school folders, toys and many other surfaces. These full color foil stickers make great giveaway items at tradeshows, fairs and conventions, but keep in mind that they can also be sold as retail items that represent your band, business, brand or cause. Elite Flyers uses only the highest quality inks and paper materials in creation of your custom printed full color foil stickers. If you need design services or advice in creation of your custom stickers, our friendly customer service and design teams are available at all hours of the day via email, phone, and live web chat. Thank you for choosing Elite Flyers for lightning fast turnaround and below-industry pricing on your paper stickers and other printing needs!